Minister of Environment and Tourism Pohamba Shifeta has met the Uukwambi Traditional Authority and the Iiheke yaNakele Community Committee on Friday over the ongoing sand mining dispute at the borrow pit at Iiheke yaNakele. 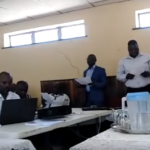 The community members who called on the minister, wants him to suspend the environmental clearance certificate dated 11th December 2018 that was issued to the Uukwambi Traditional Authority. According to Shifeta it was his first hearing where he acted as the arbitrator where no lawyers were not involved The minister stated that he keeps on advocating for such hearings. Shifeta further noted that once he reached a conclusion his decision is final and if any party involved in the dispute are not happy they can take up the matter with the High Court for further arbitration. INCC spokesperson Lukas Nantanga said they are appealing the issuance of environmental clearance certificate to the traditional authority. Nantanga noted that their appeal was made in accordance with the laws governing environmental issues. “Sand is a non-renewable resource and must be used on a sustainable basis for the benefit of present and future generations,” he added. The spokesperson of the traditional authority Iita Reinhold, denied the claim that the borrow pits are not only in Ekamba and Oshuulu. He stated that sand mining started way back in the 1970s and it continued after Independence and without the authorisation of the traditional authority. Shifeta is yet to give his judgement on the stated matter.